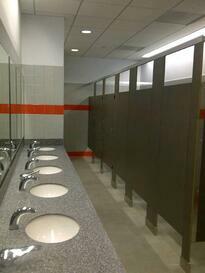 Attention Architects and Facilities Managers – Is It Time for a Restroom Refresh? If you think about it, the restrooms are one of the most visited areas of any facility – it is the only part of any building which is virtually guaranteed to see a visit from each of the building occupants at least once during the course of a workday, and there is a fairly decent chance that each of the building visitors will also stop by to use one of these areas during the course of their stay as well. Therefore it is worthwhile to consider the overall aesthetics and user experience of your restrooms. 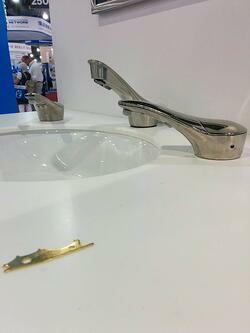 Perhaps your restrooms could use a “refresh” – and new toilet partitions and restroom accessories can make a huge difference in the appearance of your restrooms. The biggest difference which can be made to update and refresh the overall look and aesthetic of a restroom is to replace the toilet partitions and urinal privacy screens. The restroom can sometimes be a relatively harsh environment, and the expected life span of these items can vary widely depending on the quality of materials which have been used. Some of the current partitions may look tired or downright worn out – and new toilet partitions and urinal privacy screens may just the ticket to make the biggest impact on updating the look of your restrooms. And just like the designs used for other areas of your building – whether it be the paint colors, wallpaper, carpeting, flooring, light fixtures or office furniture – the design of current toilet partitions and urinal privacy screens in a restroom can sometimes be reflecting a look or materials which were popular in the “1990’s”, “1980’s”, or back to the “1970’s”, or possibly even the “1960’s”! There are a variety of new designs and materials which can be considered when remodeling your restrooms, and there are also many different colors which are available to help bring your toilet partitions and urinal privacy screens into the 21st century. If you are a Facility Manager or Architect, please don’t forget the restrooms when you are updating and remodeling your buildings – and please consider that the biggest impact which can be made when using the existing space configurations in your restrooms is to replace the toilet partitions and urinal privacy screens. Once the big items like toilet partitions and urinal privacy screens have been addressed, there is also a significant benefit to updating other parts and accessories within the restroom. Think about the mirrors, grab bars, stainless steel seat cover dispensers, stainless steel recessed combo towel dispensers and waste receptacles, counter mount soap dispensers, stainless steel feminine hygiene dispensers – and baby changing stations! It doesn’t matter whether you are a mother or father, it is always comforting to know that there is a place to go in a public restroom where you can take care of changing your baby’s diapers. And while you are in the process of refreshing your restrooms, don’t forget about adding a baby changing station for the visitors to your public restrooms. Sometimes all that is needed is a few pieces and parts to make sure existing dispensers are working properly – whether it be a new spindle for bath tissue dispensers or a new bottle or collar for a counter mount soap dispenser. And sometimes the traffic in the restroom has increased to the point that a higher capacity option is necessary. 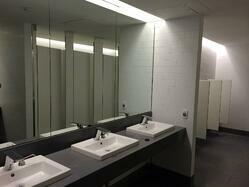 In any event, some of these seemingly minor updates can go a long way to improving your restrooms. Another reason to consider a restroom refresh is to make sure that any compliance concerns are addressed – if it has been awhile since restrooms have been designed and constructed (and inspected), it is possible that a look at ADA, NFPA and ICC codes would be another important consideration. ADA (Americans with Disabilities Act) requirements for restroom accessibility, and NFPA (National Fire Protection Association) and ICC (International Code Council) standards for fire safety should also be incorporated into your restroom refresh. And if your facility is required to Buy American – or you simply would like to source materials which are manufactured in the good old U.S. of A – please consider specifying materials which have been manufactured in America. And last but not least, a restroom refresh is an opportunity to incorporate more sustainable materials into your facility. Toilet partitions and urinal privacy screens made from HPL (High Pressure Laminate), CL (Compact Laminate), SCRC (Solid Color Reinforced Composite), Metal and HDPE (High Density Polyethylene) may contribute to earning points for a LEED project (please refer to Bobrick Technical Bulletin 95 for more detailed information). In addition, Falcon Waterfree Urinal Cartridges when used in Falcon or Sloan Waterfree Urinals can help save up to 40,000 gallons of water per urinal per year. WAXIE and Bobrick have been partners for over half a century – and over the years we have worked together to help our clients with all of their restroom refresh project needs. 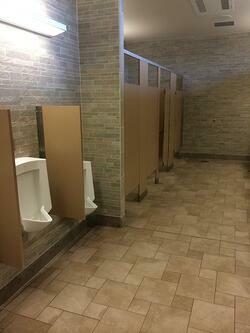 Looking for toilet partitions and urinal privacy screens – give us a call! Looking for other restroom accessories and replacement parts – give us a call (and don’t forget about the baby changing stations)! Looking for ADA and NFPA compliance – or to Buy American – give us a call! Looking to incorporate more sustainable materials and options – give us a call! Looking for vendor partners to assist with capital renewal and deferred maintenance projects for your restrooms – give WAXIE a call and we would love to conduct a consultation with our partners from Bobrick to help you with your restroom refresh project!